Back in June, in the days before the advent of this blog, I tackled a housekeeping project that haunted me for nearly two years: the paperwork. I am the family record keeper. Dave pays the bills, but I am the one who records receipts, balances accounts, does the taxes, and keeps up with the budget. 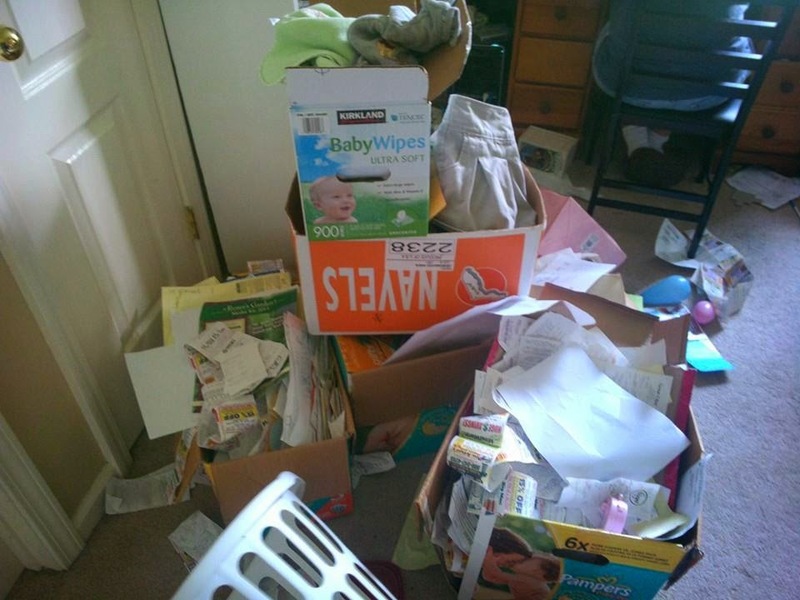 Before I was pregnant with Marian, I had a filing system in place for all the paperwork that didn't work very well for me. I loved it; it seemed like the right way, but I had a cycle of boom and bust with maintenance which meant I might have months of paperwork stacked up waiting to be filed at any one moment. The problem with the old system was that it required too much detail and I didn't have the time to sort as finely as the system called. It was just easier to dump it in a pile. I was probably already behind--who can remember--when I got pregnant with Marian and then all filing ceased. All everything ceased except surviving moment to moment. The pile grew. As my energy returned a bit, I had a large belly interfering with my ability to properly sort the piles on the floor so I didn't. The pile grew. I used empty diaper boxes to remove the stacks of paper off of my desk to pretend action had been taken. Marian was born. Who has time to deal with paperwork with a newborn? The pile grew. I used more boxes. I had to go back to work and all my spare moments were consumed with baby. The pile grew. Our schedule normalized, our sleeping developed a pattern, my energy increased and I had a big problem: this pile of paperwork was too much to deal with in any one sitting and impossible with children present. The pile grew as I contemplated a solution. Months passed. The pile grew and earned its own name: the Paperwork Pile of Doom. Finally a solution presented itself. In June, my parents took the three oldest for a week of visiting at their house. I took several days off of work while most of the children were gone, and Dave and I had a multi-day extravaganza which was well documented on FB. It was glorious to have the space back. We didn't get completely finished because we still had multiple bags of paperwork to shred which didn't happen for at least six months, but we won't mention that part. All in all though, I was pleased with the results. After we finished I finally felt like I had a grip on the possibility of keeping the paperwork filed appropriately. I developed a new filing system that wasn't as elegant as the old one, but was a reasonable way to handle the monthly paperwork and keep the monthly receipts organized and ready to shred when necessary. I rocked the new system for the first few months and felt competent and excited. I never wanted to face the Paperwork Pile of Doom ever again. The normal cycle of paperwork is that the papers stack on the desk until I have time to sit down and attend to record keeping. In my perfect world, I would input receipts and file paid bills as soon as possible, daily even, but that is not possible. What usually happens is that a couple of weeks pass and then I sit down and attend to the pile all at once. The filing part of this routine would take only a minute or two. Then something terrible happened. In the fall, Marian started climbing and she loved climbing the computer desk. One day when climbing around, she grabbed and dumped about two weeks worth of unprocessed paperwork onto the floor and into a pile of the kids' assortment of paper goodies. Oh papers, papers everywhere. Important papers intermixed with children's drawings. Papers and trash and little bits of paper because children love to tear up paper into bits. Papers and crayons and coloring books and tear-outs all in a big heap. Paper. I was crestfallen. This job of resorting the papers was more than I could bear. It would not have taken *that* long, probably an hour, but it just seemed so much more than the minute or two I was ever willing to spare handling paperwork. The paper sat mixed up in the floor for weeks. Rather than pick it up, I let it lie. If I wasn't going to pick it up, the rational response would have been to start fresh with the next month, keep the filing system going, and then get to the pile in the floor whenever I could. I didn't do that either. Instead I started piling paperwork on my desk, just like the old days. So now I am back at the beginning. 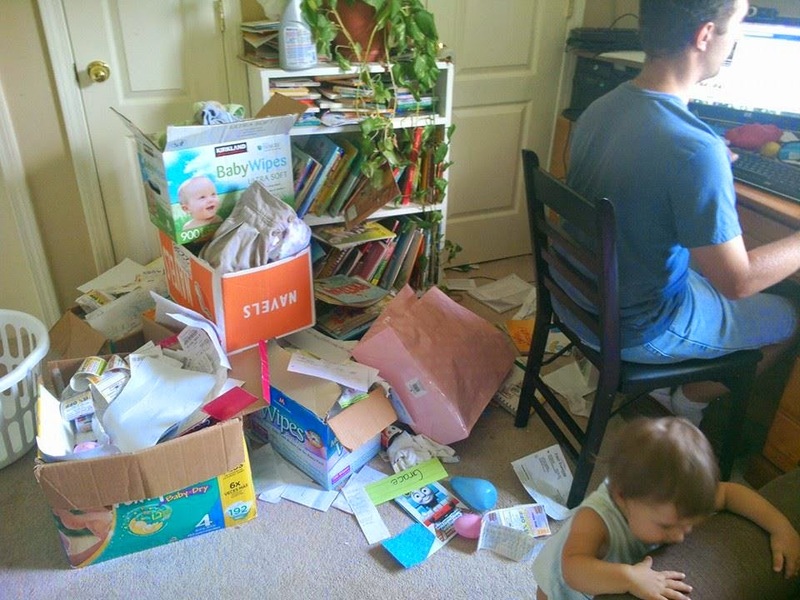 Right now I have about three months worth of paperwork piled on my desk and am just about at the point where I might, if I had not walked down this road before, grab a diaper box and toss it in there until I could get to it later. I resist. I am not too far gone. This job will require two or three hours of work without the children. Maybe I could get Grandma to take them for the afternoon sometime soon. I still think this new system will work, but I *have* to keep up with it and need to find a better response than denial when a wrench is thrown in the system. The silver lining is that I did keep the monthly receipt system going. The receipts haven't been shredded yet--we have a shredding problem, but they are organized and ready to go. I only need to tame the seeds of what could grow into another Paperwork Pile of Doom. I admire your commitment to recordkeeping and budgeting. Seriously, I still think you are ahead of the game for most families, pile or no pile. I have a new approach to paperwork (for us). Whereas before we had the pile of doom, now I just discard anything that's not tax or identity related. Seriously. Are there really that many reasons to file paperwork anymore? I know there may be a day when I need this stuff, but feel like I could access digitzed records through my bank, utilities, phone accounts (most of which I've switched to auto-pay anyway). We took a day and cleaned out our files and condensed to one remaining cabinet. I hope it doesn't come back to bite me one day, but in the meantime, it's nice not to have that pile guilting me anymore! I've just been taking pictures of paper and shoving them unfiled or sorted into Evernote and then trashing the paper. But I can't be said to actually record keep so I shouldn't even be on the Internet talking about this. I know I keep way too much stuff. Rationally I know I could get rid of probably half of what I keep, but I love finding old records, a la the pay stub above. I am also highly suspicious of auto-pay. I am paranoid and crotchety. The only thing we have automated is my monthly donation to SQPN. That's it. So I know there is a whole bunch of my normal routine where I could cut down on the required time, but it makes me anxious to not have my hands on it. I have been trying to figure out a good system for the paper piles since I moved out/got married 3+ years ago. I had a half-decent system going last year--I could do my budgety things without frantically hunting for That One Piece of Paper all the time--but then we moved and somehow "We are going to have a whole extra room to use as an office and will be able to organize without the baby destroying everything" turned into "We are going to pile all our unsorted stuff indiscriminately into one room and let the baby play in there and make it even more disorganized." I really need to enforce the "no baby in the office" rule, but my laptop is in here and the laptop battery is shot so I can't take it anywhere else and sometimes it's just easier to let the baby pull books off shelves while I sit on Facebook. So, yeah...disorganized = Not just you.